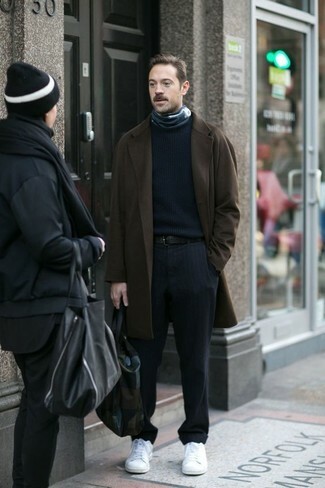 For a nothing less than incredibly stylish look, consider teaming a dark brown overcoat with navy vertical striped dress pants. Choose a pair of white low top sneakers to make the getup current. 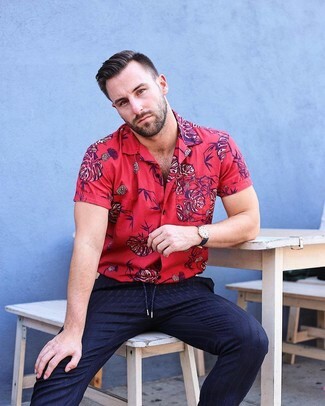 This combo of a red floral short sleeve shirt and Dries Van Noten Blue Slim Fit Pinstriped Wool Suit Trousers from MR PORTER speaks rugged sophistication and class. 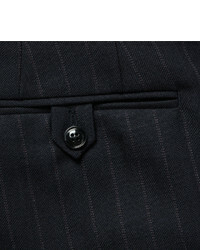 Team a navy overcoat with navy vertical striped dress pants for a classic and refined silhouette. 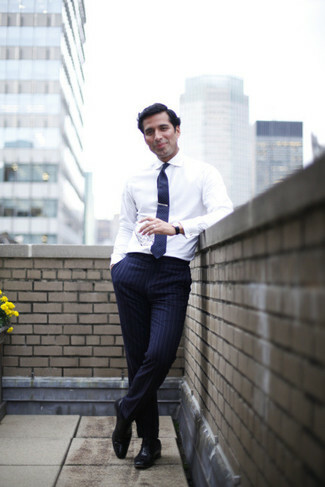 For something more on the daring side to complement this getup, grab a pair of black leather tassel loafers. 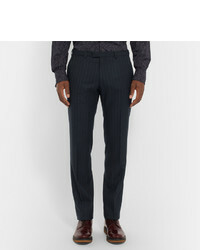 For a nothing less than incredibly stylish getup, pair a light blue dress shirt with navy vertical striped dress pants. 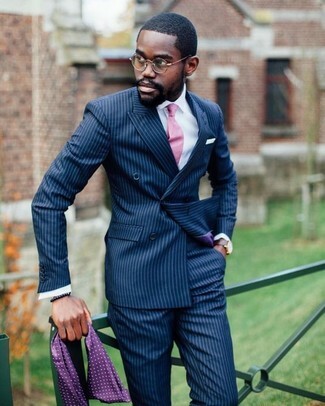 For a nothing less than incredibly stylish getup, choose a navy vertical striped double breasted blazer and Dries Van Noten blue slim fit pinstriped wool suit trousers. 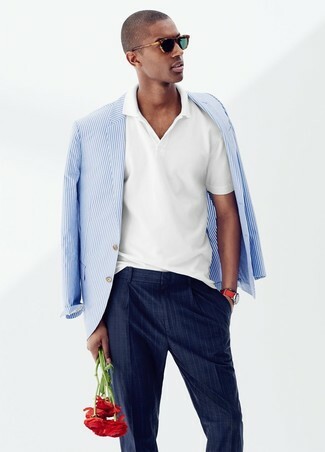 Reach for a navy vertical striped double breasted blazer and Dries Van Noten blue slim fit pinstriped wool suit trousers for a classic and refined silhouette. You could perhaps get a little creative in the footwear department and elevate your ensemble with burgundy leather oxford shoes. 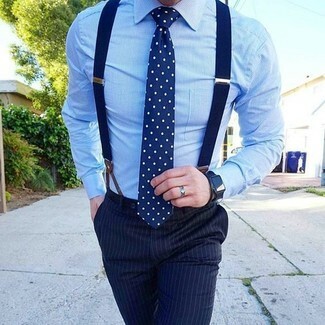 For a nothing less than incredibly stylish getup, make a white and blue vertical striped blazer and navy vertical striped dress pants your outfit choice. As you can see here, looking seriously stylish doesn't take that much time. 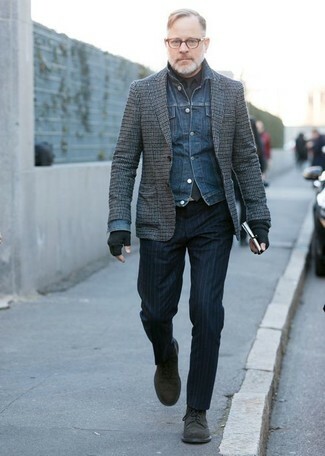 Just consider wearing a blue denim jacket and navy vertical striped dress pants and you'll look incredibly stylish. Black suede derby shoes complement this getup quite nicely. 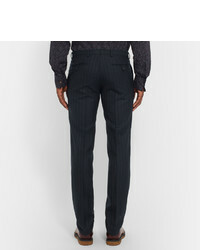 Consider pairing a white dress shirt with navy vertical striped dress pants to ooze class and sophistication. Rocking a pair of black leather oxford shoes is a simple way to add extra flair to your getup.